Where Buried and/or Commemorated: France - Trefcon British Cemetery, Caulaincourt, Aisne. Edgar was educated at Raunds Church of England Schools, and Kimbolton College. He volunteered for active service at the age of 16 and enlisted into the R.A.M.C. on 10th May 1915. He served three years at Southampton Docks, being employed in the disembarkation of the wounded, then went to France on 4th April 1918. 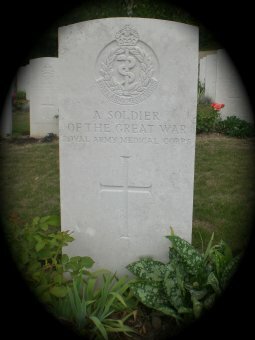 The Chaplain wrote to his family: �He had been out all night with a party, bringing the wounded down from the regimental aid posts into advanced dressing stations of the Field Ambulance; while discharging this duty, he was outside one of the aid posts with a party, when a small shell exploded very near them. The force of the explosion blew some into the air, but left them practically unhurt..... In some way he must have got the main force of the explosion, and death was due to the shock... Your boy is mourned by us all... You may rightly be proud of one who served so splendidly in this great cause.� Edgar was the eldest son of Henry and Agnes Mary (daughter of Henry and Marion Cullum) Ellingham of The Police Station, Raunds, Wellingborough, Northants.